In my experience, most people go through life mostly on autopilot with very little commitment to a purpose. It is the fortunate few who become aware of a purpose which ignites their passion for life and gives it meaning. Many times it is the result of an unexpected health or physical challenge. My good friend Paul Gagnon, a well known Southwest Florida endurance cyclist, had a choice to make after a serious back injury. He could sit on the sidelines or he could commit to living. He consciously made a decision to become an endurance cyclist and has not looked back. Paul constantly rides long distances and competes in distance cycling events like Hampster and the 24 hours Sebring endurance ride. It has become his purpose. On a flight recently, I read the stories of many athletes who sustained devastating and life changing injuries, many of them as cyclists. The recurring theme was the progression of emotions they experienced in coming to grips with paralysis and other severe limitations. Many of them seriously considered suicide when they focused on the abilities they had lost. But those who thrived after such an experience made a decision, not only to strive for their best recovery, but commit themself to achieving a goal with a purpose. 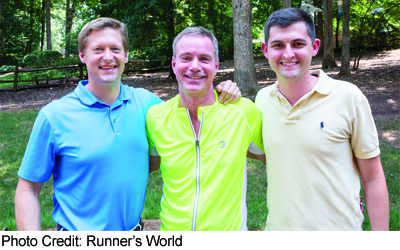 One of the most interesting stories was about Dean Otto, a Charlotte runner and triathlete. Dean was on a bike ride in the misty predawn darkness. He was wearing reflective socks, a lighted reflective vest, and had lights on his bike. Nevertheless, he was hit from behind by 21 year old Will Huffman who was trying to make out the way ahead through the foggy windshield of his F150. Otto was left paralyzed from the waist down from multiple fractured vertebras and other injuries. An emergency surgery was performed by neurosurgeon Matt McGirt who did not expect Otto to ever walk again. McGirt’s assessment was not shared by Otto, who, rather than falling into resentment and depression, immediately forgave the driver and challenged his doctor to commit to running a half marathon together. Despite all the odds and his surgeon’s skepticism, Otto progressed from wiggling his toes, to walking with a walker, light jogging and eventually returned to running. Through a series of miraculous events, the driver sought out Otto in the hospital to apologize. Of course, Otto shocked Will by expressing his forgiveness and they went on to become friends. With Otto’s rapid recovery the surgeon began to train in order to keep his word about running with Otto if he was able to return to long distance running. The three of them eventually ran that half marathon Otto had challenged his surgeon to complete. The point of all this is the choice Otto faced, the same one every serious injury victim faces. What do I do from here with the ability I still possess? The successful find and commit to their purpose which makes all the difference in the life they create after their recovery. Those of us who have never faced such obstacles will live much fuller lives if we consciously choose to do the same.